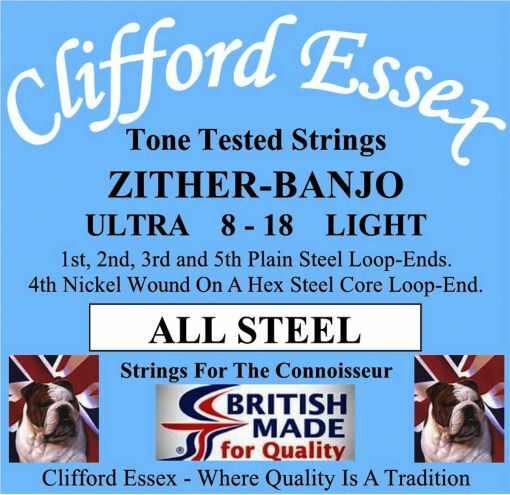 ZITHER-BANJO STRINGS. ALL STEEL. LOOP-ENDS OR BALL-ENDS. 8 - 18. Location: /Strings/Banjo strings/Zither-Banjo/ZITHER-BANJO STRINGS. ALL STEEL. LOOP-ENDS OR BALL-ENDS. 8 - 18. Zither-Banjo (22 Frets) 5 Strings. Tuned g. C. G. B. D. or g. D. G. B. D.
1st .008" Plain Steel Loop-End or Ball-End. 2nd .010" Plain Steel Loop-End or Ball-End. 3rd .015" Plain Steel Loop-End or Ball-End. 4th .018" Nickel Round Wound Loop-End or Ball-End. 5th .008" Plain Steel Loop-End or Ball-End. Strings 3 Sets: 10% Discount. (+£10.20) No Thanks. ZITHER-BANJO STRINGS. REGULAR. 9 - 34.